Let me tell you about my new tool toy. First, let me say that I had researched and researched. I've toyed with getting a Dyson for over a year after listening to my youngest sister rave over her's during our family Christmas 2006. But still..."Can a vacuum really be that good?" I thought. YES! Can a vacuum be worth that much money? YES! I almost talked myself out of it. I looked at Orecks after listening to a dear friend's love for hers. I almost just gave up on vacuums totally. The one I had was completely worthless. I would go over one session of carpet a gazillon times only to have it still look the same: dirty. And my sewing room with all those little threads? Forget it! It had been to the repair shop; it had its bag changed each time I used it. It hated me, and I hated it. Then I met Dyson. For the first time in my life I LOVE, yes LOVE, a vacuum cleaner. I vacuumed the whole living area of my house last night. I used the way too cool "Quick-draw Telescope Reach™ wand" to vacuum (with such ease it isn't funny) all the spider webs off my high ceiling. I emptied the bagless canister 2 times last night. Two times!! It was so gross and yet so much fun to think all that dust and dirt was gone. 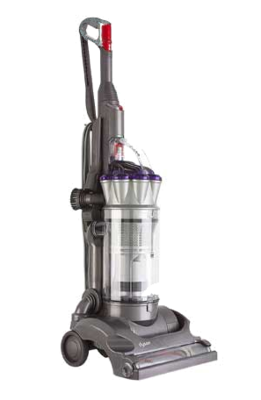 I bought (really dh bought me) the Dyson DC17 Absolute Total Clean from Sam's Club. All I can say is, "Why did we wait so long?"